Bank of America boasts four different credit card rewards programs, extending coverage to both business and consumer cardholders. These programs vary in terms of the system by which members earn and redeem for perks. For example, some programs only offer cash back cards while others allow members to redeem for gift cards, travel accommodation or charity donations. Details for earning and redeeming rewards vary drastically across the programs, so it can be hard for newcomers to gauge how much value they can get out of each. But don’t worry – we’ve collected and assessed all of the insider details to provide you with the best information and tips regarding Bank of America’s credit card rewards programs. 4 Pros & Cons of Bank of America Rewards 5 Where Does Bank of America Rewards Rank? Each of Bank of America’s four rewards programs operates on a different earning system. Not only do they vary in terms of the rewards currency they issue and the base earning rate they offer, but they also feature different ways for members to supplement their earnings. Picking the Right Card: Depending on the credit card you have, you may be able to earn more points or cash back in addition to the base rate provided. For example, the WorldPoints Rewards for Business Visa Card offers 2X the points on gas, dining and office supplies compared to the 1 point on all other purchases. This enables cardholders to earn a lot more compared to the AOPA Business MasterCard with WorldPoints Rewards, for example, which earns 1 point per dollar spent. Shopping at BofA’s Online “Malls”: If you are in the WorldPoints Rewards or Travel Rewards program, you can earn a lot of extra points by purchasing items through the programs’ respective online shopping portals (WorldPoints Mall or Travel Mall). Earning ‘Customer Bonuses’: Bank of America Travel Rewards and Bank of America Cash Rewards offer ‘customer bonuses’, which enable members to earn extra by adopting a banking relationship with BofA. Bank of America Cash Rewards– If you redeem your cash back in the form of a deposit into a Bank of America checking or savings account, your cash back amount increases by 10%. Bank of America Travel Rewards– If you maintain an active Bank of America checking or savings account, you earn an additional 10% in customer bonus points. Booking Travel in the Travel Center: For Bank of Americ Travel Rewards members, you can earn 3 points per dollar spent at the Travel Center website (compared to the base rate of 1.5 points per dollar). And don’t worry, WalletHub has already confirmed that prices in the Travel Center are comparable to those on other major booking websites. However, note that this only applies for the first $6,000 spent per calendar year. Signing Up for Preferred Rewards: Credit cards in the Bank of America Cash/Travel Rewards programs are eligible to boost their earnings by signing up for the Preferred Rewards program (this is a separate rewards program for banking accounts). Note that this feature replaces any existing ‘customer bonuses’ from either program. Earnings Don’t Expire: Rewards currencies from Bank of America Travel/Cash/Better Balance Rewards never expire by date or from account inactivity, meaning that your earnings will remain usable even if you don’t swipe your credit card for years. That is not true for WorldPoints customers, however, as you’ll see in the restrictions section below. No Earning Limit: There is no maximum cap for how many points or how much cash back you can earn. No Minimum Threshold: You are not required to spend a certain amount on your credit card in order to begin accruing points or cash back. No Rotating Categories: None of the BofA rewards credit cards feature rotating categories, meaning that you don’t have to worry about signing up for short-term bonus categories in order to earn extra. Earnings Can Expire: Earnings from WorldPoints expire five years from the month in which they were earned. This is not true for the other Bank of America rewards programs. Earning Rate Varies Based on Amount Spent: For all of the credit cards in the Bank of America Cash program, the earning rate changes depending on the amount spent – in other words, 2%-3% cash back on bonus categories only applies to the first $1,500 spent in combined bonus purchases per quarter. Now that we’ve covered how you can earn the most rewards currency, the next step is to determine how you can best spend it. We at WalletHub stress that redeeming your earnings in the most lucrative way possible is just as important as maximizing your earnings. Your earnings are money at the end of the day, and you want to spend it in a way that yields the most value. 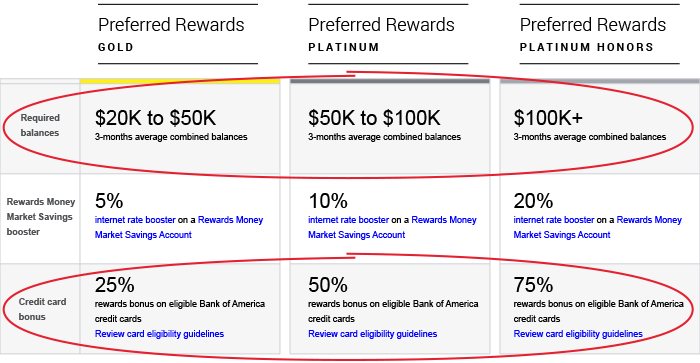 So, the ultimate question is: Which redemption options offer the most value to the members of each of Bank of America’s four different rewards programs? In order to display this info as clearly as possible, WalletHub did the calculations for each program separately. If you have a WorldPoints credit card, redeeming for travel offers the most value, while cash back offers the least, as you can see in our table below. How Much Are WorldPoints Worth In Different Redemption Options? The following table provides a detailed breakdown of the graph above. 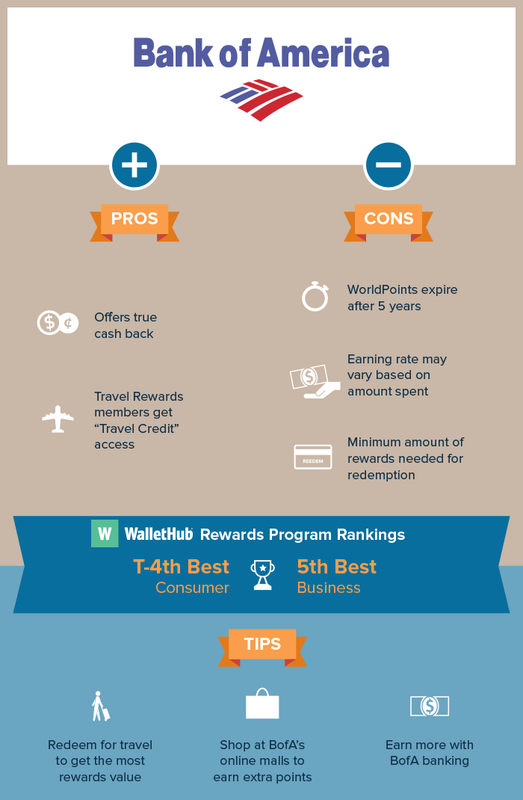 It indicates the monetary value of each point when redeemed through the different options provided by WorldPoints Rewards. *These redemption values are averaged from the airfare rates below. Note that when redeeming for airfare with Bank of America WorldPoints Rewards, you can use one of two options: Flex Air or Premium Air. For Flex Air, every point equals 1 cent. If you choose this option, a $300 ticket will cost you 30,000 points. EXPERT TIP: As shown above, there are instances when you can extract more than one cent per point if you use the Premium Air option. For example, if you’re purchasing a domestic air ticket costing $400, the Premium Air option yields 1.6 cents per point while Flex Air offers 1 cent. 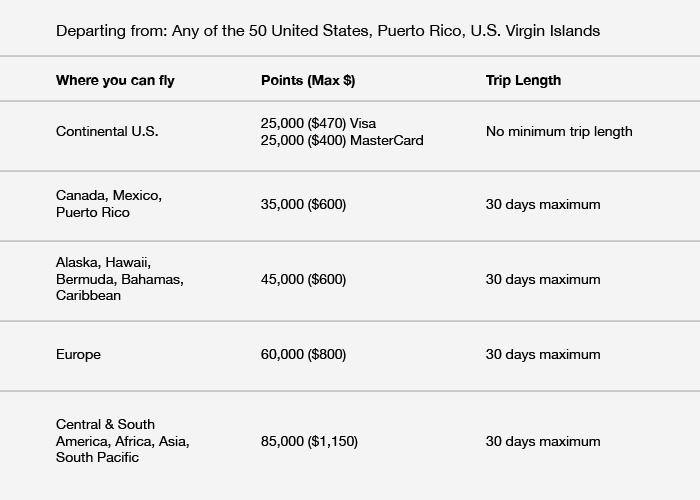 Keep this in mind when booking airfare through the WorldPoints program. Unsurprisingly, redeeming for travel is the most lucrative option for Bank of America Travel Rewards. 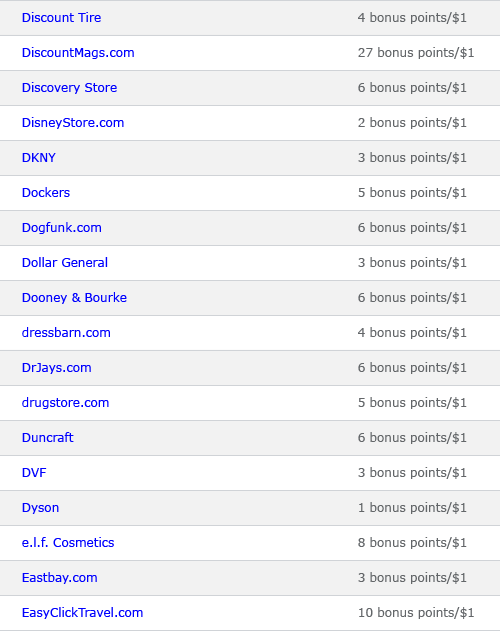 Again, cash back yields the least value, as you can see below. How Much Are Travel Rewards Points Worth In Different Redemption Options? The following table provides a detailed breakdown of the graph above. It indicates the monetary value of each point when redeemed through the different options provided by Bank of America Travel Rewards. With Bank of America Cash Rewards, redeeming is very straightforward as there are no middleman currencies involved – you simply redeem for true cash back at the same percentage rates in which you earn. For example, if your card provides 2% cash back on a given purchase, you would receive 2% of what you spend on that purchase as a rebate. Though cash back is your only redemption option for this program, you can choose to redeem it in the form of a check, statement credit, charity donation, deposit into any banking account or a mortgage payment – from BofA or a third party. TravelCredit: Bank of America Travel Rewards members have the flexible option of using “Travel Credit,” which permits you use your points to offset any travel purchase (this includes flights, hotels, cruises, bus lines, taxis, timeshares, amusement parks and more). True Cash Back: The Bank of America Cash/Better Balance Rewards programs actually provide rewards in the form of cash, which protects you from rewards devaluation. Minimum Threshold: You must earn a minimum amount of rewards in order to redeem under Bank of America’s programs. For Bank of America Travel Rewards and Bank of America WorldPoints Rewards, redemption begins at 2,500 points. For Bank of America Cash Rewards, you can only begin collecting cash at $25. Limited Automatic Cash Redemption Options: Bank of America Cash Rewards allows members to set up “automatic cash redemption,” which is a feature that automatically redeems for cash at the end of every month if you have accrued at least $25 in earnings. Though it’s meant to save customers the hassle of manually doing so themselves, the feature is only applicable with a BofA deposit or mortgage account, which renders it useless for members who do not have either. Poor Point Valuations for Charity Redemption: Although low point valuations for cash back aren’t too uncommon, you’d think one would be more generous when it comes to charity, right? Apparently not. Bank of America gives 0.60 – 0.78 cents per point to the charity you designate. Compared to the other rewards programs likeCiti ThankYou Rewards or No Hassle Rewards, which offer 1 cent per point on charity donations, BofA doesn’t measure up. Bank of America’s rewards programs do not feature any transfer partners. Therefore, when redeeming for travel, WorldPoints Rewards members can only use the options offered through the WorldPoints redemption center while Bank of America Travel Rewards members can only use the travel credit option. While this may seem restrictive in terms of travel redemption, the former option can offer up to 1.74 cents per WorldPoint (which is more than what most transfer partners provide) and the latter option offers more flexibility. Now that we’ve evaluated each of Bank of America’s rewards programs, it’s time to outline their key pros and cons, as well as their “fluff” features that don’t really add much. Travel Credit– This flexible option permits Travel Rewards members to use their points to offset any travel purchases at a solid 1 point: 1 cent ratio. True Cash Back– The rewards currency for the Bank of America Cash/Better Balance Rewards programs is cash, rather than points or miles that can be redeemed for cash along with a host of other redemption options. Earnings Don’t Expire– Rewards from the Bank of America Travel/Cash/Better Balance Rewards programs never expire by date or from account inactivity. No Earning Limit– There is no maximum cap for how many points or how much cash back you can earn. No Minimum Threshold For Earning– You are not required to spend a certain amount on your credit card in order to begin accruing points or cash back. No Rotating Categories– None of the BofA rewards credit cards features rotating categories. Program-Wide Ways to Earn Extra– The Travel Center, Travel Mall, WorldPoints Mall and Preferred Rewards options enable members to earn a significant amount of additional rewards currency when making purchases. Earnings Can Expire–WorldPoints earnings expire 5 years from the month in which they were earned. Earning Rate Varies Based on Amount Spent– For credit cards in the Bank of America Cash program, the earning rate changes depending on the amount spent. Minimum Threshold– You must earn a certain amount of rewards before you can begin redeeming. Gift Cards – For WorldPoints members, if you are redeeming for a gift card valued at $250 or more, you should just redeem for cash back instead (because at $250, both cash back and gift cards yield the same point valuation). Not only is cash back more flexible, but you can then spend that money at the WorldPoints Mall and earn more points as well. Where Does Bank of America Rewards Rank? WalletHub scored each issuer’s primary credit card rewards programs according to a standardized grading methodology in order to provide a basis for comparison. Bank of America Travel Rewards ranked 4th (tied with Discover) within the list of consumer credit card rewards programs assessed and WorldPoints Rewards ranked 5th for business credit card rewards programs. Check out the results below. I would like to redeem points. Do not know what to do.